Mass A (2.0 kg) is moving with an initial velocity of 15 m/s in the +x-direction, and it collides with mass B (5.0 kg), initially at rest. After the collision, the two objects stick together and move as one. What is the change in kinetic energy of the system as a result of the collision? This is College Physics Answers with Shaun Dychko. By conservation of momentum we can say that the total momentum before the collision mA times vA plus mB times vB equals the total momentum after the collision. But since the objects stick together there is only going to be one object with a mass of mA plus mBand it'll have one common velocity, we'll call it v prime. We can solve for v prime because we want to know what the velocity is after collision because then we'll use that to calculate the kinetic energy after the collision and compare that to the kinetic energy before collision. So we divide both sides by mA plus mB and we get this line here and we're told that mass B is initially at rest which means this term is zero. So v prime reduces to mA vA divided by mA plus mB. 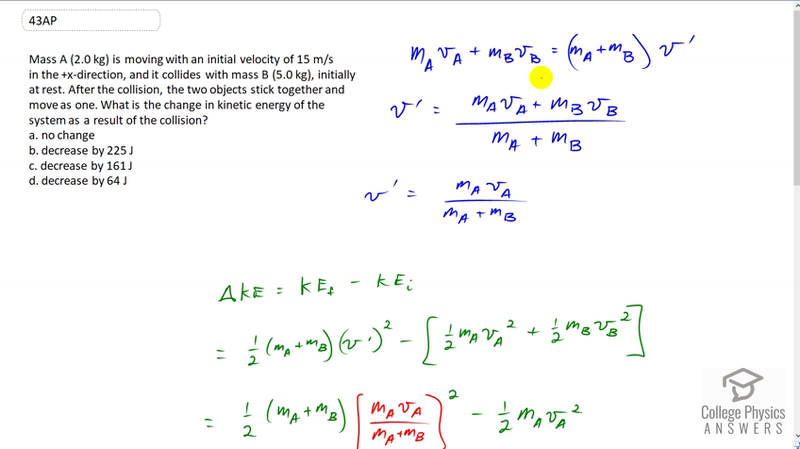 So that's mass A times velocity A before collision divided by the total mass. Then we'll consider what the change in kinetic energy is. It's going to be the total final kinetic energy minus the total initial kinetic energy. The final kinetic energy will be one half times the total mass because they stick together, times v prime squared, that's the velocity after collision, v prime, and then we'll subtract from that the kinetic energy initially which is one half mA vA squared plus one half mB vB squared. But again vB is zero, mass B is at rest initially, so that term is zero and so this becomes one half mA plus mB times this factor here which is a substitution for v prime which we determined from our conservation of momentum formula. We plug that in here for v prime. mA vA over mA plus mB and then minus just this term here since this term was zero because vB was initially at rest. Then at this point you know, you could if you wanted to, you could plug in numbers over here because we're given mass A and velocity A and mass B. You could find a number and then plug that number in here and then make all the other things numbers and get an answer. But I like to do algebra, I think it's fun so I'm just going to keep on going until we get an expression that tells us what the change in kinetic energy will be. So I will square the denominator here, mA plus mB and then it's going to be the power of one though because one of them will cancel with this one. We can factor out the common factor one half. So we get mA squared vA squared when you square the numerator as well, divided by mA plus mB to the power of one, minus mA times vA squared. Then we'll simplify this by getting a common denominator and by also factoring out the common factor mA vA squared. So mA vA squared is outside now of the bracket and we're left with the number one here which we multiply by mA plus mB over mA plus mB and that's just on this one factor here by the way. We end up with this line here. So it's mA which is what's left over after you factor out mA vA squared from mA squared vA squared, and then minus this bracket. So we have mA minus mA so that mass A disappears and this becomes a negative mB on the top. So that negative is here, so it's negative mA times mB that's left over in the numerator, times vA squared, divided by two times mA plus mB. So there's our algebraic expression for the change in kinetic energy after an inelastic collision where objects stick together, given that one of the objects is initially at rest. So we can use that formula for any problem that asks the question like that. So we have negative two kilograms times five kilograms times 15 meters per second squared, divided by two times two plus five kilograms, giving us negative 161 joules. So the negative means it's a decrease in kinetic energy after the collision and the answer is C.